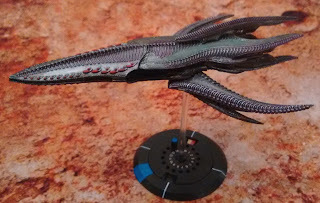 For the upcoming Dropfleet tournament at Onslaught on Saturday, I painted up the all-resin version of the Scourge battle cruiser, the Akuma. 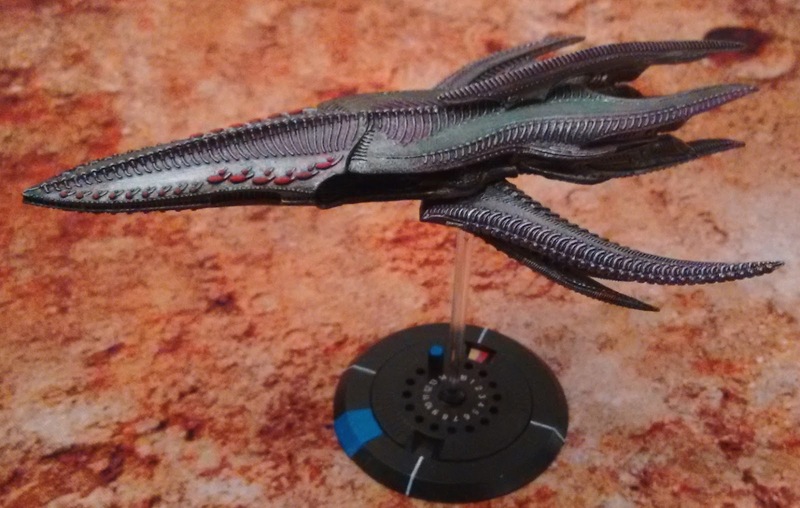 It has the same paint scheme as all my other capital ships, and will replace the model I've been using as a proxy. The ship actually looks quite different from other Scourge vessels, having a nose with a style that doesn't match any of the existing ships. The large "wings" are from the battleship though, so there is some commonality of design. 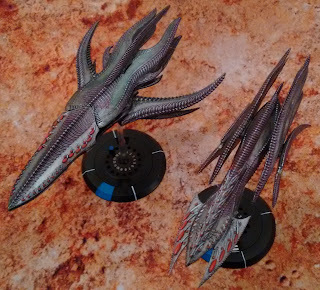 Because there is an option for two types of battle cruisers, of course I magnetized the ship to be either. 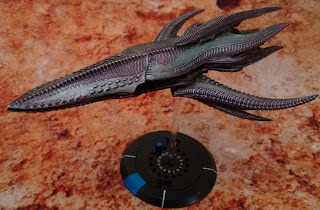 This is the alternative head with close range plasma weapons instead of the normal occulus beams. When you put it next to the Basilisk, the resin/plastic combination model from the Kickstarter with exactly the same stats, the newer ship looks much larger. Even here, next to the battleship, the Akuma looks like it's the same length, just quite a bit thinner. It's a really nice looking model, and I hope it will be lucky in the tournament. 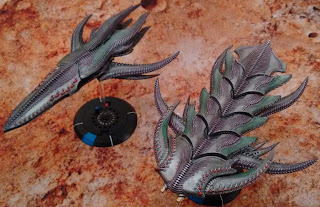 NIce blog here, I like the Scourge and your Epic Tyranids in particular. You have some annoying spam issues on earlier pages tho, just so you know. Keep up the cool stuff! Those look great! I have some Scourge painted up as well. The detail on the models makes them a joy to finish up. I hope to get some larger ships like you soon. Best of luck in your tournament!